Hope Pregnancy Center takes donor privacy very seriously. We will not sell, trade, or share a donor’s personal information whether received online or in any other manner, to any other entity without prior written approval from the donor. There is a new way to give a one-time or recurring gift to HPCC as we now have text giving available! Register and How to Give? Just text Text ‘HPCC’ to 444999. You will receive a return text with the different giving options. Type the number of the giving option you’d like to select and hit send. The next message will ask how much you would like to give, type in a dollar amount. Dollar signs are not necessary and for whole numbers you do not need to add a decimal. Next you’ll be asked to click on a link redirecting you to the giving site where you will enter in your credit/debit card and personal information. When text giving is complete, you will receive a receipt for the gift via text message..
Visa, MasterCard, AMX, and Discover are accepted. You can give any amount you want. You can also setup reoccurring pledges as well. There is no software and no app that needs to be installed on your phone. No need to download software to the user’s mobile phone. All you need is a normal mobile phone, and SMS. Make sure your premium SMS or shortcode phone number is not blocked on your plan. 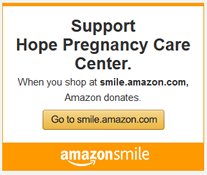 Yes, Hope Pregnancy Care Center is a 501c3 organization and all donations are tax deductible. You will receive a receipt via text message. At the end of the year, your donations will be included on the tax receipt letter and mailed to you. Can I change the credit card I am using to a different credit card or just Opt-out? If your credit card information has changed, we’ve made it even easier to update it in your text giving system. To opt-out of the text giving plan and have your information removed completely or to stop reoccurring donations, simply text the word ‘Stop’ to your secured shortcode. If you decide to opt-out and want to donate again, you will have to opt back in by Texting ‘HPCC’ to 444999 to receive a new personal giving shortcode. Please Contact us with any questions you have regarding our text giving plan. Amazon and the Amazon logo and AmazonSmile and the AmazonSmile logo are trademarks of Amazon.com, Inc. or its affiliates. Amazon and AmazonSmile is not affiliated in any way that implies sponsorship or endorsement of the cause or position on any issue of HPCC.